Do your kids love to be fully involved in creating their own works of art? Do they like to create BIG projects with friends? Well, BIG art may just be what you’re looking for to encourage creativity, gross motor movement, and collaboration. It’s more about the process of creating a BIG piece of art and seeing where it takes you than producing a predetermined project. We especially love BIG process art because it often involves new and innovative ways to create art by ditching the paintbrushes and using materials you wouldn’t typically think of. BIG process art activities are great for outdoors clean up is quick and movement is more flexible. When planning for BIG art projects, it’s good to have large pieces of cardboard, a roll of art easel paper, and an old sheet or tarp that you don’t mind getting messy. 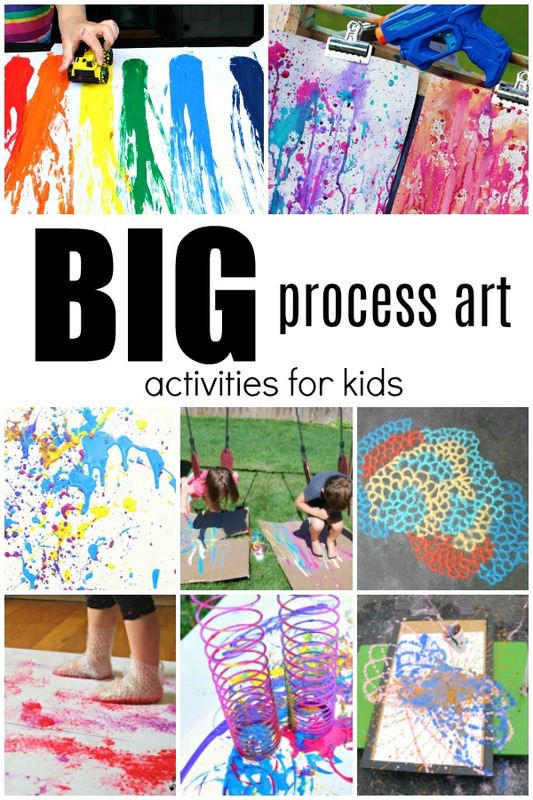 Here are some fun BIG process art activities for kids that we hope you enjoy! 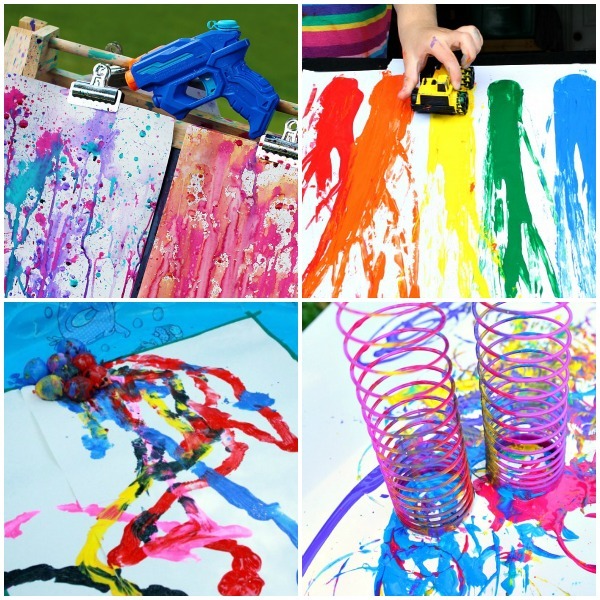 Squirt guns and paint make for the perfect hands-on process art activity for kids thanks to Fireflies and Mudpies. Make a ramp, grab some cars, and race them down to make a beautiful rainbow mural painting with cars. Lasso the Moon has a fun way to create some outdoor abstract art with water balloons, paint, and a few friends! Have fun creating some Slinky process art by dipping them in paint and seeing what happens as they move! Place some rocks at the top of an incline and watch them roll and paint into a beautiful piece of art! 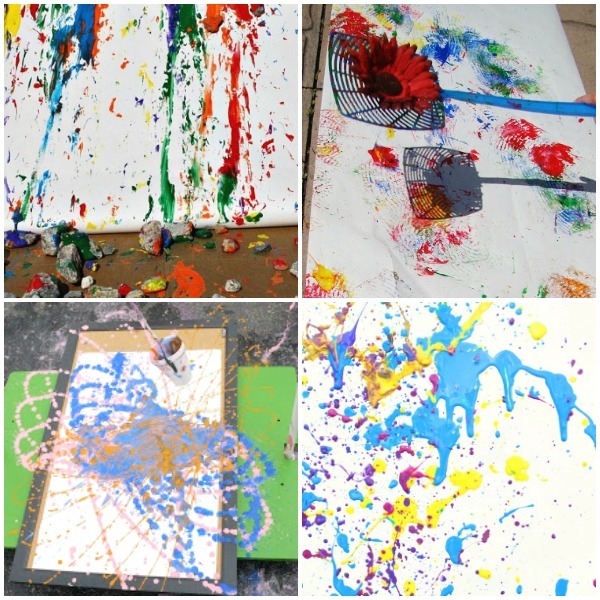 This fly swatter paint activity from Reading Confetti will have your kids swatting and creating unique and collaborative works of art. Create a pendulum painting station like Child Central Station and just watch your art designs unfold as it swings back and forth! These DIY shooters for ping pong balls are a fun way to get kids engaged in creating their own process art. 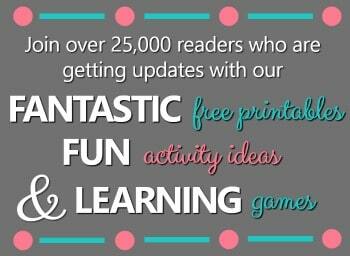 They’ll love pulling back the balloon shooter to aim and paint! Grab some veggies and some friends to join in on the fun in stamping vegetables. This collaborative art activity would be perfect for a garden, farming, or vegetable theme. You get a healthy snack out of your materials too! We love how this gross motor process art from Home Grown Friends combines swinging and painting! Try out this neat art mural with salt like Buggy and Buddy did. 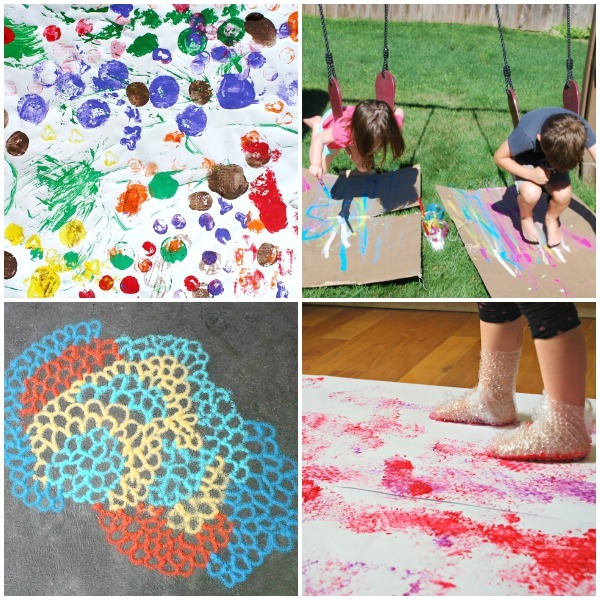 Wrap some bubble wrap on the feet and get stomping to create colorful bubble wrap art like Mess for Less. 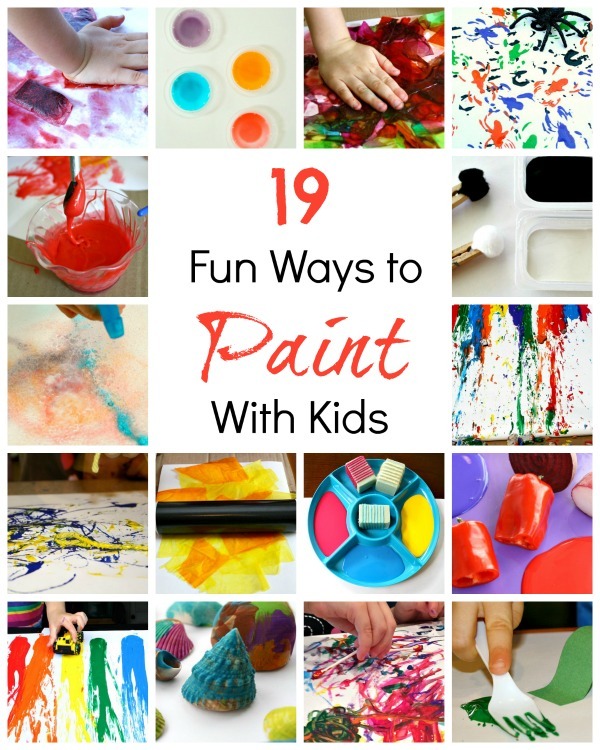 Continue the fun with these creative ways to paint-no paintbrushes required! Wow! amazing idea. 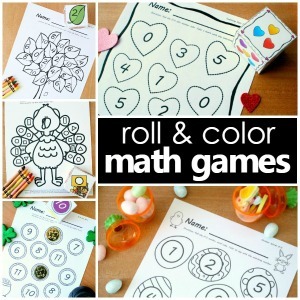 This kind of creative fun art project for kids encourages kids creativity and helps kids mental growth.